Home / Chennai / Chennai Super Kings / CSK / IPL / IPL 12 / IPL 2019 / IPL 2019 Match Preview / M.A. 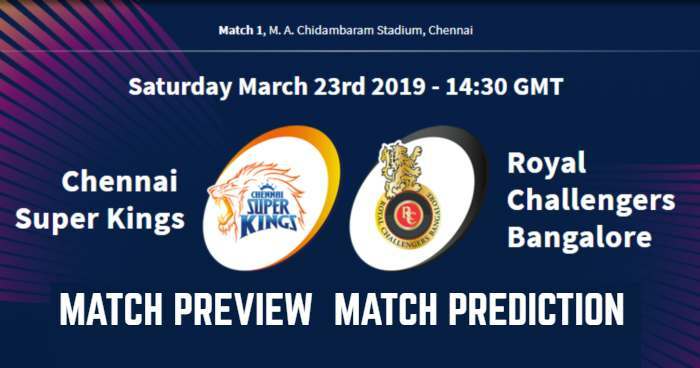 Chidambaram Stadium / Match Prediction / RCB / Royal Challengers Bangalore / IPL 2019 Match 1 CSK vs RCB Match Prediction, Preview and Head to Head: Who Will Win? IPL 2019 Match 1 CSK vs RCB Match Prediction, Preview and Head to Head: Who Will Win? Defending champions Chennai Super Kings (CSK) will face-off against Royal Challengers Bangalore (RCB) in the opening match of the 12th season of Indian Premier League (VIVO IPL 2019) on 23rd March 2019 at M.A. Chidambaram Stadium, Chennai. Chennai Super Kings are making a return to their home ground. Banned for two years for 2016-2017 and then after their first home match in IPL 2018 were forced to play their home match in Pune due to the Cauvery water dispute protest which forced the BCCI to shift matches out of Chennai to Pune. As far as weather is concerned, clear skies have been forecast while the temperatures will be around the 30ºC mark but really feel will be around 33ºC with high humidity in the range of 65-75%. There's a lot of grass in certain parts of the pitch with certain areas which are fuller do look dry. Spinner will come into play; Ravindra Jadeja, Imran Tahir and Harbhajan Singh form CSK side while Yuzvendra Chahal with one or more of Moeen Ali, Pawan Negi, Gurkeerat Singh and Washington Sundar. It will be a low scoring match. Chennai Super Kings have been the most consistent franchise of the IPL; who have always been in the top four, are a formidable side at home but often tend to start slow in a season and are usually late bloomers in the IPL. Chennai Super Kings almost retained everyone from the last year winning combination and continuing with army of oldies. CSK's strength lies in their slower bowlers which is ideal for the traditional spin-friendly nature of the Chepauk. Ravindra Jadega, Harbhajan Singh and Imran Tahir would be their key bowlers. But pace department will fell the absence of Lungi Ngidi, who was ruled out of the season with a side strain; Mohit Sharma is most likely to take his place to open bowling with Shradul Thakur. Royal Challengers Bangalore have retained 15 players from their 2018 squad and bought nine more players at the IPL Player Auction 2019. RCB will facing concerns over the availability of some foreign players at different stages of the tournament due to international commitment. Currently Marcus Stoinis and Nathan Coulter-Nile missing out the first few games because of international commitments. Yuzvendra Chahal will be the key bowler in the batting dominant team. Chennai Super Kings (CSK) and Royal Challengers Bangalore (RCB) have played 21 matches against each other in Indian Premier League (IPL). Chennai Super Kings won 14 of them and Royal Challengers Bangalore won 7 matches. Chennai Super Kings have been undefeated against Royal Challengers Bangalore in last 6 matches. Chennai Super Kings and Royal Challengers Bangalore have played 7 matches against each other at M.A. Chidambaram Stadium Chennai; out of which Chennai Super Kings have won 6 matches and Royal Challengers Bangalore have won only oe match. Chennai Super Kings have a 34-14 win-loss record in IPL matches at the M.A. Chidambaram Stadium in Chennai. RCB have won only two of their 8 matches at the venue. Sides batting first have won the 6 matches of the last 8 matches here. A bit last two matches were won by the team batting second. So toss-winning captain would like to chase on this field. The average score here batting first has been about the 145-run mark; 160+ will be a par score on this wicket. While CSK is a three-time champion and RCB is the biggest underachiever despite boasting of some of the best names in its squad. The outcome of Saturday's game will depend on which team bowls better and holds its nerve as both side have players who can turn a match on its head in a jiffy. Playing XI for RCB: Virat Kohli(c), Parthiv Patel(w), Moeen Ali, AB de Villiers, Shimron Hetmyer, Shivam Dube, Colin de Grandhomme, Umesh Yadav, Yuzvendra Chahal, Mohammed Siraj, Navdeep Saini. CSK Squad for IPL 2019: MS Dhoni (c & wk), Imran Tahir, Ruturaj Gaikwad, Sam Billings (wk), David Willey, Murali Vijay, Ravindra Jadeja, Deepak Chahar, Narayan Jagadeesan (wk), Suresh Raina, KM Asif, Shradul Thankur, Dhruv Shorey, Mohit Sharma, Faf du Plessis, Monu Kumar, Dwayne Bravo, Chaitanya Bishnoi, Karn Sharma, Lungi Ngidi, Shane Watson, Ambati Rayudu, Harbhajan Singh, Kedar Jadhav, Mitchell Santner. RCB Squad for IPL 2019: Virat Kholi (c), Mahammed Siraj, Marcus Stoinis, Moeen Ali, Nathan Coulter-Nile, Akshdeep Nath, AB de Villiers, Shimron Hetmyer, Parthiv Patel (wk), Milind Kumar, Yuzvendra Chahal, Navdeep Saini, Tim Southee, Colin de Grandhomme, Pawan Negi, Devdutt Padikkal, Shivam Dube, Himmat Singh, Kulwant Khejroliya, Umesh Yadav, Gukreet Mann Singh, Heinrich Klaasen (wk), Washington Sundar, Prayas Ray Barman.